This blog post was first written in 2008. 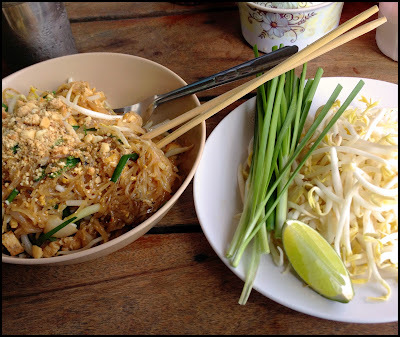 The Phad Thai Shop is still there, I still eat there and I finally got round to updating this post now in 2015! Phad Thai is a very common Thai dish made from noodles, egg, chili, tofu, normally some shrimp or some chicken, plus onion, fish sauce, nuts, lime... ingredients can vary. You can order Phad Thai in 10 different places and get 10 different tasting meals depending on the amount and variety of sauces added, the size and type of noodles used, type of meat added and so on... Phad Thai can be bland sometimes or it can be spicy, it can be dry or saucy. You get a lot of variety out of one dish! If bought from a street stall or roadside restaurant you're normally only going to be paying 40 - 50 Baht for your lunch - it's a cheap dish to make and thus a popular lunch all over Thailand, nearly as popular as Noodle Soup (Kuaytiow). 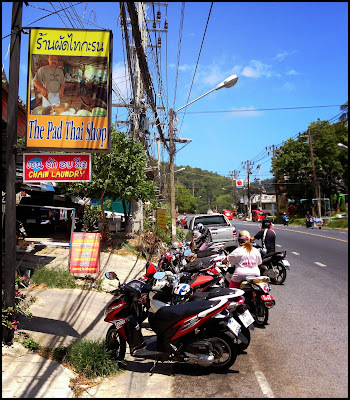 Close to our dive shop, Sunrise Divers in Karon Beach, on the back road near the Baan Karon Resort, there's one of the most popular little lunchtime restaurants I have seen in Phuket. Every day workers in the local area flock here for lunch, and the most popular dish is Phad Thai. The restaurant does not really have a name except "The Phad Thai Shop". They also do noodle soup with chicken or beef, a good Phad Grapow with beef, a popular fried rice with crab. The menu is expanding - when I first ate here in 2005 they had only Phad Thai or Noodles and beef stew. It's open every day from quite early until late afternoon. Mostly caters to a local lunch crowd. 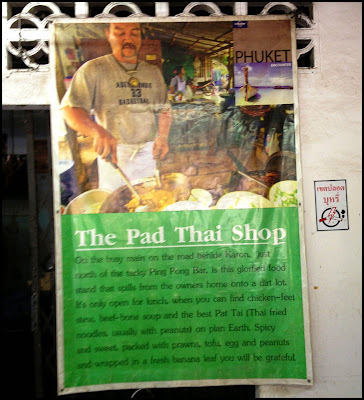 (above) There used to be just a wooden handwritten sign (in Thai) - now the Phad Thai Shop is easier to spot! It's only a little place but it can be packed at lunchtime. You can get Phad Thai to eat there or take away - the take away is wrapped in a banana leaf. The cooking is mostly done by one guy, with others helping to serve noodle soup, package up takeaways etc.. You can see the huge bowls full of chicken and beef at the counter - these are ladled over the noodles. The famous Phad Thai is really tasty, and you have extra bowls of chili sauce, prik nam pla (fish sauce with chili) and dried chili on the table in case it's not spicy enough for you. You can get Phad Thai there either to eat there or take away. Bear in mind that by Western standards this is not really a "restaurant" - a collection of tables in a shack by the road outside someone's house... but this is real local eating here in Phuket. 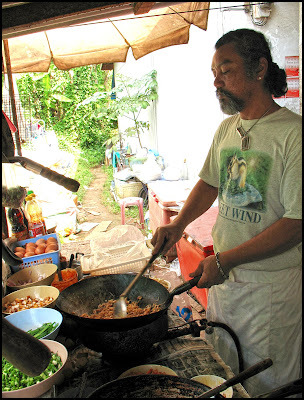 If you want to mingle with the people, get on the back roads and get some Pad Thai right here! I tend to get food from here at least once a week as it's so cheap and close to work.... oh and very tasty! Phad Thai is 50 Baht and it's a huge portion. The place was "tarted up" a couple of years ago with a concrete floor and nicer tables, but still the same food and same price (50 Baht). Just before the Baan Karon Resort on the way from Karon to Kata on Patak Road. It's not a big obvious restaurant, just a small local place... just look for the sign saying "The Phad Thai Shop". If in doubt come to see us at Sunrise Divers first. Only a few minutes away. Part of the reason for the new sign and the slight improvement in decor was the visit of a writer from the Lonely Planet guide, who was directed here by me and a former employee at Sunrise Divers. I recall the owner being very happy to be listed in the guide and they have a 5 foot tall copy of the page on the back wall! (above) Listed in Lonely Planet and proud of it!